As soon as the weather cools, I rush to make risotto. 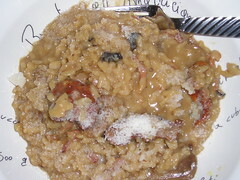 I know there are summery versions, but to me it is a fall/winter dish, as my favorite risotto includes the rich flavors of pancetta and porcini mushrooms (and sometimes truffle oil). The one on the left also includes a scattering of other varieties of dried, wild, mushrooms from the northwest U.S. I buy dried porcini whenever I see what look like good quality ones, intact slices with pale centers, not a bunch of broken up brown bits. I rehydrate them in water (warm or almost hot), and save the liquid, which eventually goes into the pot. I always keep pancetta on hand (carefully wrapping slices and freezing! ), although of course you can use American style thick cut bacon instead. Pour the water over the dried mushrooms and soak for 20 minutes, while you assemble the rest of the ingredients. Drain the mushrooms, saving the soaking liquid. Pass the liquid through a fine mesh strainer or cheesecloth to remove any grit and reserve. In a medium-sized heavy-bottom saucepan, heat the olive oil and add the pancetta. Sauté pancetta until golden, remove with slotted spoon and set aside on a paper towel. Pour off most of the oil and fat in the pan, and add 1 tablespoon of the butter. Sauté the onion in the butter over medium heat until transparent, then add the rice and stir about one minute, until it becomes translucent. Add the white wine, and stir until the rice absorbs almost all the wine. Serve with parsley and additional cheese sprinkled onto each serving, and a few drops of truffle oil if desired.